The northern circumpolar constellation of Ursa Minor was one of the 48 original constellations listed by Ptolemy, and remains one of the 88 modern constellations recognized by the IAU. Ursa Minor is currently the location of the north celestial pole, yet in several centuries, due the precession of the equinoxes, it will change. Ursa Minor covers 256 square degrees of sky and ranks 56th in size. It contains 7 main stars in its asterism and has 23 Bayer Flamsteed designated stars within its confines. 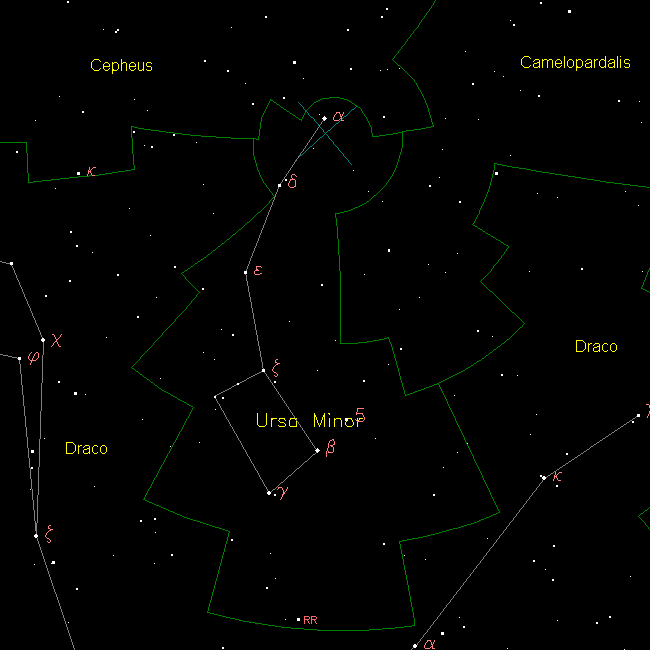 Ursa Minor is bordered by the constellations of Draco, Camelopardalis and Cepheus. It is visible to all observers located at latitudes between +90° and ?10° and is best seen at culmination during the month of June. There is one annual meter shower associated with Ursa Minor called the Ursids. Beginning on or about December 17th of each year, we encounter the meteoroid stream and activity can last through the end of December. The meteor shower itself is believed to be associated with Comet Tuttle and was probably discovered by William F. Denning during the 20th century. The peak date of activity occurs on December 22 during about a 12 hour window and you can expect to see about 10 meteors per hour on the average from a dark sky location. In mythology, Ursa Minor is meant to represent a baby bear with a very long tail. Perhaps this springs from the “tale” of Kallisto and her son, who were placed in the sky as a bear and son. The tail is believed to be elongated from have been swung around the north star! In some forms of mythology, the seven stars of the Little Dipper were considered to be the Hesperides, daughters of Atlas… and it forms the “dragon’s wing” in yet other stories. While the “Little Dipper” asterism is a bit more difficult to recognize because its stars are more faint, once you do understand the pattern, you’ll always remember it. How? The star at the end of the little dipper handle is Polaris, the North Star. Polaris is easily identified by drawing a mental line through the two stars which form the end of the “bowl” of the Big Dipper and extending that line five times the distance. Now, let’s take a look at Ursa Minor! While there are only a very few deep space objects here (and they require a large telescope) that doesn’t mean the constellation isn’t interesting. One handy thing to note is the stars themselves. The four stars in the “bowl” of the little dipper are unusual because they are of second, third, fourth and fifth stellar magnitude. While that might not seem like a big deal, it’s a great way to judge your sky conditions. What is the dimmest of the stars that you can see? Beta (B) is 2, Gamma (Y) is 3, Zeta (the squiggle) is 4 and the unmarked corner is Eta (n) and it is stellar magnitude 5. Ready for the brightest star? Then say hello to Alpha (a) – Polaris. Alpha Ursae Minoris is also known as the “North Star” and even as the Lodestar. While it might be 430 light-years from Earth, it is currently the closest star to the north celestial pole and a main sequence supergiant star. But don’t just glance at it and walk away… Get out your telescope! In 1780, Sir William Herschel noticed something a little strange when he was looking at Polaris, and so will you… it has a companion star. That’s right. Polaris is a binary star. Not only that… But when astronomers were examining Polaris B’s spectrum, they noticed something else… You got it! Polaris B also has a spectroscopic companion, making this a tertiary star system. Are you ready for more? Then get this… Polaris A is also a Cepheid variable star! While its changes are very small (about 0.15 of a magnitude every 3.97 days), Polaris has brightened by 15% since we first began studying it and its variability period has lengthened by about 8 seconds each year since. That makes Polaris more than just a another star… It’s a super star! Now aim your binoculars at Beta Ursae Minoris. Its name is Kochab and it is about 127 light years from our solar system. This orange giant star shines about 130 times more brightly than our own Sun. Somewhere around 3000 years ago, Kochab was once the pole star – but as Earth’s precessional motion changed, so did its position. Even then it still wasn’t quite as close as Polaris! How about Gamma Ursae Minoris? That’s the “Y” symbol on our chart. Known as Pherkad, this spectral class A3 star is about 480 light years away and it is pretty special, too. Why? Because it’s a Delta Scuti type variable star and its brightness varies by 0.05 magnitudes with a period of 3.43 hours. While you’re not going to notice any change by just watching, image the power behind a star that shines 1100 times more luminous than the Sun, and possesses a radius 15 times larger! Are you ready for Epsilon? Then get out the telescope, because 347 light year distant Epsilon is an eclipsing spectroscopic binary star. (Say that five times fast!) It is classified as a yellow G-type giant star with a mean apparent stellar magnitude of 4.21. In addition to light changes due to eclipses, the system is also classified as an RS Canum Venaticorum type variable star and its brightness varies from magnitude 4.19 to 4.23 with a period of 39.48 days, which is also the orbital period of the binary. The binary it orbited by a third component, Epsilon Ursae Minoris B, which is an 11th magnitude star, 77 arc seconds distant. Now for Delta – the “8”. Delta Ursae Minoris is about 183 light years away and goes by the strange name, Pherkard. While it isn’t as grand as its mates, at least it is a white A-type main sequence dwarf star! Last, but not least, is RR Ursae Minoris. You’ve got it… The double letter designation denotes a variable star. While changes are very small (4.73 at minimum and magnitude 4.53 at maximum) it’s the period that counts here. The changes take period of 748.9 days to happen! This means that RR has been highly studied to make sure it doesn’t have a spectroscopic companion – and so far none have been found.